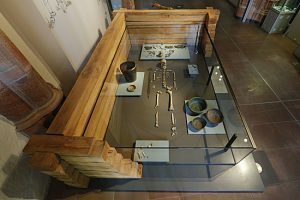 Recently I travelled to the Archäeologisches Museum Frankfurt with Valerio Gentile to examine the finds from the Fürstengrab of Frankfurt-Stadtwald, an exceptionally rich Early Iron Age chamber tomb that yielded an extraordinary set of grave goods. 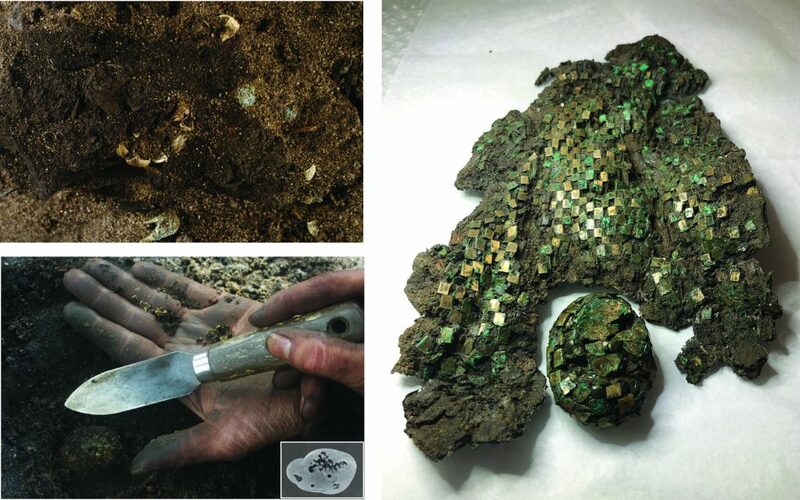 As it is geographically the closest Hallstatt culture burial to those of the Low Countries (which I studied during my PhD), it forms a great find to start exploring the remarkable connections that existed between these areas during the Early Iron Age, as well as a ridiculously exciting archeological find in its own right. As the museum is currently re-analyzing the skeleton, they were happy to welcome us to perform a re-examination of his grave goods, which in turn will help us reconstruct the funerary ritual through which he was laid to rest. Everyone at the museum was exceptionally helpful and kind, making it an absolute pleasure to work at. For three days we worked on our analyses out in the exhibition halls, which was a first for me. Normally I get put in an office somewhere and the objects are brought to me, but here they set up a workstation for us by the glass case in which the Fürst’s remains and grave goods are displayed. In essence making us part of the exhibition! One by one I took the objects out of their display case, giving priority to the well being of the objects over personal comfort (it involved me crawling around on the floor a lot – one of the few times I really wished I had worn pants rather than be ‘overdressed’!). 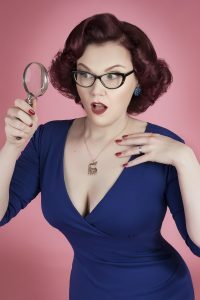 Overall this was a brilliant work set up, as it meant I could re-examine finds as ideas came to me, or as observations noted on one object made me want to re-examine others. While I examined all the finds, trying to establish how objects were made and looked for signs of how they were used, Valerio turned his attention to the Fürst’s sword (as well as some weaponry from other sites). 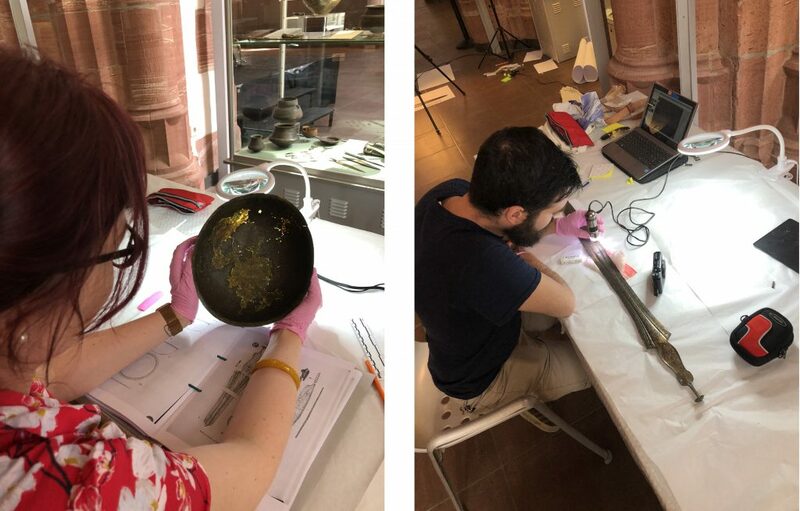 Valerio is currently a PhD candidate specialising in use-wear on bronze weaponry, and very kindly performed a microscopic use-wear analysis on the bronze sword buried with the Iron Age ‘Keltenfürst’ (check out his Academia page for more on his work). Thanks Valerio! For me personally it was absolutely thrilling to finally getting my hands on this material (I have been wanting to examine this burial FOR YEARS). Not only because the archeology is so spectacular, but because it is all so well preserved. I am used to finds from Dutch and Belgian elite burials, which tend to be burned and fragmented as a result of the very destructive funerary ritual that was practiced in this region. Compare for example this picture taken during excavation of Mound 7 (above, left), and this picture from the Frankfurt yoke (above, right). Our analysis showed that the studs we see on the left, originally formed a yoke knob similar to the Frankfurt one on the right. The Mound 7 example, however, was so far gone that when lifted it completely fell apart, and all that could be restored were some of the bronze stud fragments. And as you can see, in Frankfurt I could actually pick it up (below, center)! I am afraid I cannot share much more of our discoveries as we are still working through our analyses, but I still wanted to share our experiences, as well as some pictures of the beautiful finds that we got to spend some time with. Good times!